In my opinion, there is no “go-to” standardized test for childhood apraxia of speech (CAS) out on the market at this time. I personally feel it is very difficult to attempt an accurate diagnosis of CAS within the 15-30 minutes it takes to implement these standardized tests or checklists. So over the years I have created my own checklist to help achieve an accurate differential diagnose of CAS as compared to other disorders (e.g. dysarthria, oral apraxia, phonological processing/patterning issues, articulation disorders, etc.) and I am very excited to share it with you today. 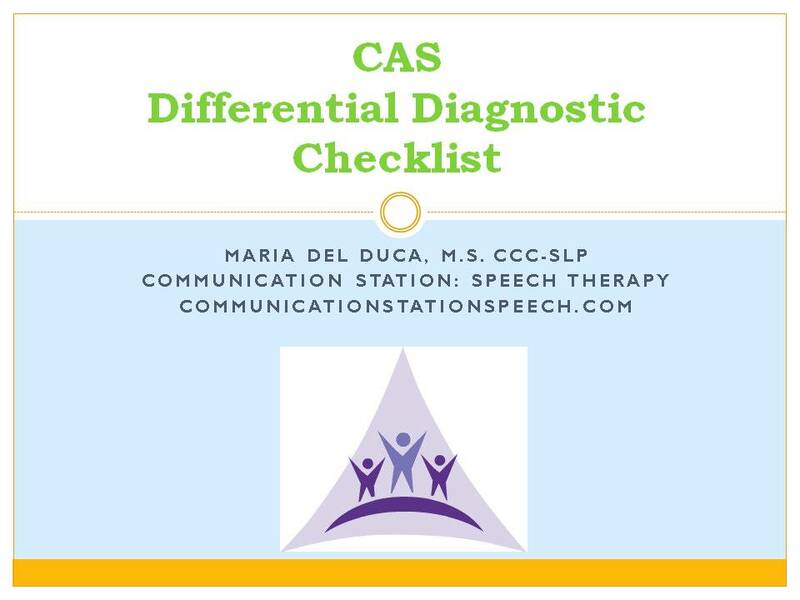 Based on my clinical experience, the key to effective differential diagnosis of CAS, is in recording a pattern of behavior over a period of time (numerous sessions over a period of weeks or months). The consistent use of behaviors related to CAS is one indicator to support such a diagnosis. While recording a pattern of behaviors, I also like to trial various communication therapy techniques (related and unrelated to treatment of CAS). If clients, who appear to present consistent signs/symptoms of CAS ALSO respond positively to therapy techniques used for children with CAS, I feel this is clearer indication that CAS is present. Conversely, clients who may exhibit a number of signs/symptoms of CAS but respond to therapy techniques NOT related to CAS, may in fact have an different underlying problem with speech production and a different diagnosis (e.g. phonological processing/patterning issues, articulation disorder, dysarthria, etc.) may be more appropriate. 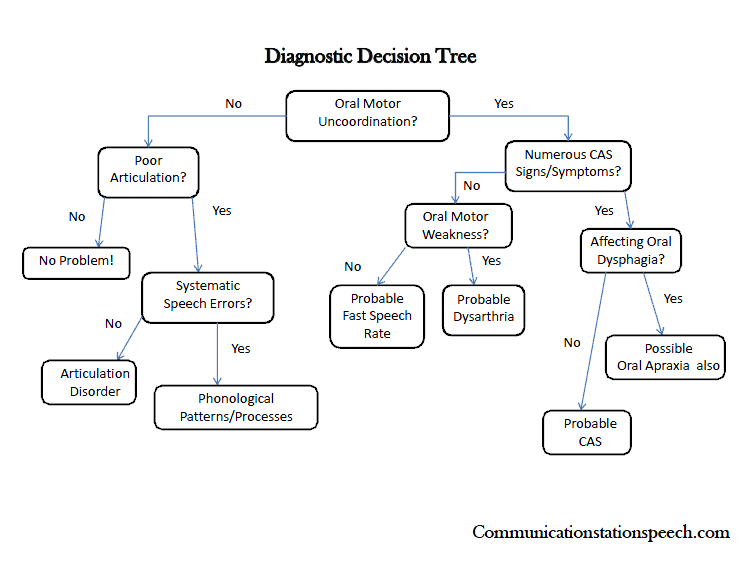 In order to accurately complete a differential diagnosis, one must first take a clear medical, developmental and family history of their client, assess oral motor skills for non-speech activities, determine if a pattern of CAS behaviors exist in speech production, followed by attempting a number of therapy activities to determine which techniques have a positive impact on speech production. 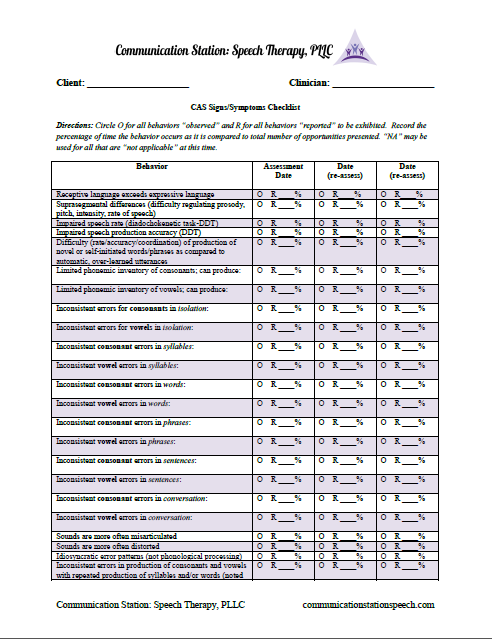 In this packet you will receive checklists for all portions of this assessment as well as a diagnostic decision tree to aid in making the most accurate diagnosis. For more information or to purchase this product click here! Spotlight on Smart Speech Therapy: Why Obtaining Accurate Developmental History is Crucial! Articulation Goals: Working Beyond the Developmental Model! ← FREEBIE Friday: Mayflower “Inferences”! I do not fully understand this message. It registered that you have downloaded the tongue thrust assessment on my end, but are you saying it did not open up on your computer screen? This has happened to one other customer when they were using a MAC computer. Not sure what the issue is with MACs but she was able to open it up and save on a PC. I just approved you for another download. Feel free to sign in to your account and download again. When it opens up, just save the download (not the link) to your hard drive and you should be good to go. I am sorry for the inconvenience.